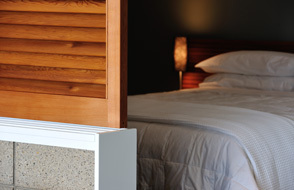 Both of our guest suites offer the finest facilities. Each self contained suite includes a tiled bathroom and fully equipped kitchen. Our suite accommodation includes a sumptuous breakfast served in your suite or on your private deck. We regret 216 is not as disability friendly as we had hoped. Each suite has a step between the dining and the bedroom areas. 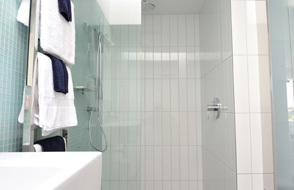 The bathroom has a walk-in shower, heated towel rail, luxury towels, heater and hair dryer. The bedroom has a sliding louvre partition to screen the bedroom from the living area. Suite accommodation includes a delicious breakfast served in your suite or private deck.